gustia: Fresh Pea, Fava, and Asparagus Risotto. Spring on a Plate. Fresh Pea, Fava, and Asparagus Risotto. Spring on a Plate. 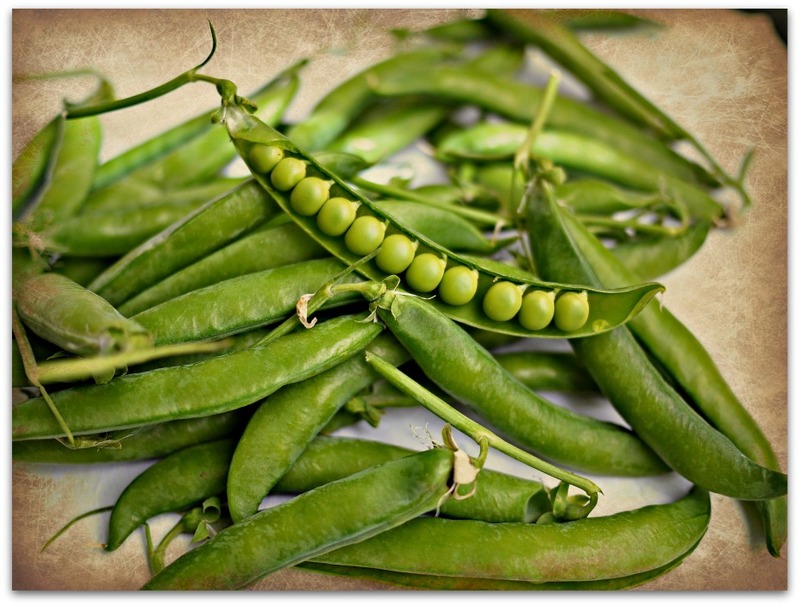 I just love fresh peas. When they're just off the vine, they're a sweet, tender and sublime spring gift. At this time of year I just can't get enough of them and it seems that this isn't going unnoticed. On Thursday when I was queuing in the Monaco Market to pay for my third kilo of peas in the same week, my favourite vendeuse, Romy, asked me "encore Jennifer?!" Busted! I think she was hinting that I leave some for her other customers. 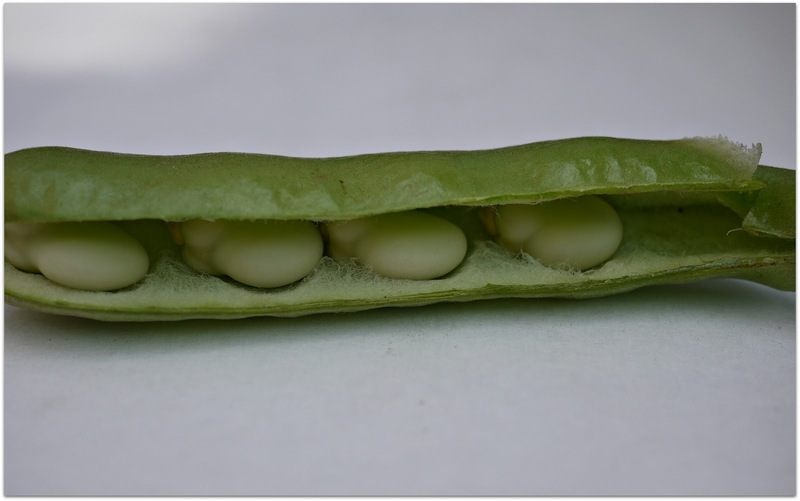 Looks like I'm not alone in my passion for peas. The first time I saw them elevated to the gourmet status they rightly deserve was while dining at the two Michelin starred restaurant at l'Hostellerie Jérome in the charming village of La Turbie, France. Chef Bruno Cirino offered them to us in small dishes, raw and unadorned, as the first of several amuse bouche. I thought it was brilliant. 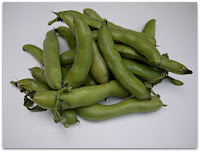 Last summer I was sampling some of the season's first peas at Ottawa's Main Farmers' Market and next to me was a sweet little boy of about 4 doing the same. After tasting a few, he held out his hand towards the vendor and offered to buy some with 3 rocks and a penny. My heart filled with joy. I think this recipe for risotto captures the fresh flavour of peas and the joys of spring! 2. Blanch the vegetables one by one. Start with the asparagus. Boil in salted water for one minute. Remove with a slotted spoon and place in the ice bath. After a few minutes in the ice bath, scoop them out and set aside in a bowl. 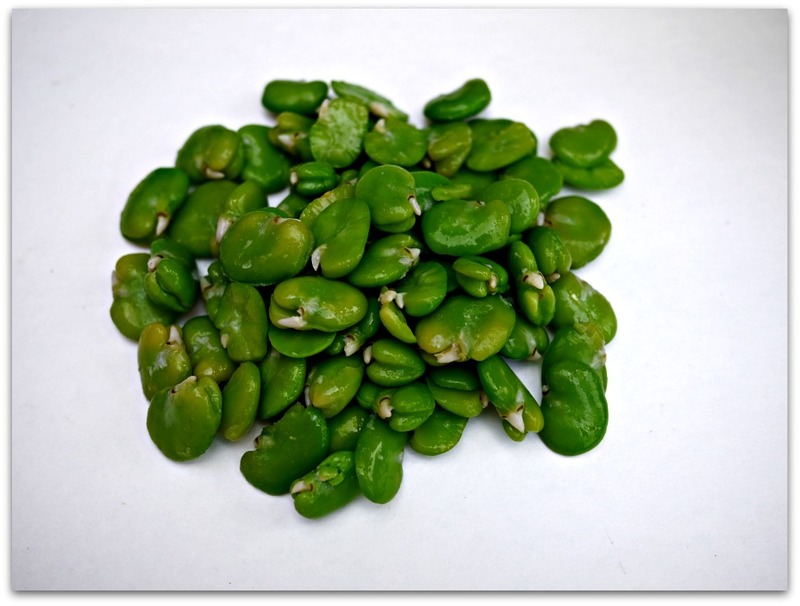 Repeat with the fava beans, 30 seconds, then the peas for 30 seconds. 3. 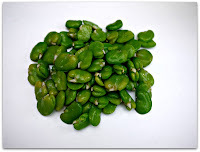 Peel the fava beans and set aside. 4. 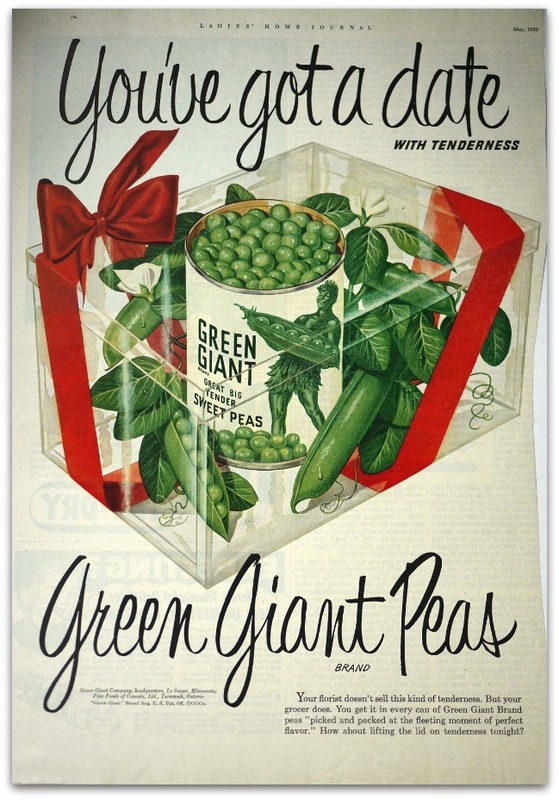 Reserve a few tablespoons of peas and purée the remaining ones. Add a bit of water if necessary to achieve a smooth paste. 5. Heat your vegetable stock in a saucepan and maintain on a simmer. 6. Melt the oil and butter in a large saucepan. Add the onion or leek and sauté on medium heat until soft. Add the Arborio or Carnaroli rice and stir for about one minute. Add the wine and stir until evaporated. Add about 1/2 cup of stock and stir the Risotto until the liquid has evaporated. Add another half cup of stock. Stir. Keep adding the stock, a half cup at a time, stirring after each addition until the rice is cooked to "al dente." If you run out of stock you can use boiling water. 7. 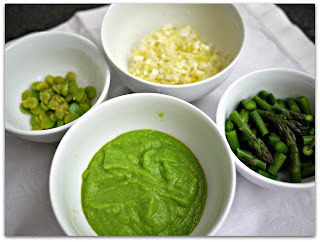 Add the asparagus, fava beans, whole peas, pea purée and basil and stir to heat through. 8. Turn off the heat, add the Parmesan, and stir vigorously. You can also add a teaspoon or two of butter at this stage if you wish. Adjust the seasoning. 9. 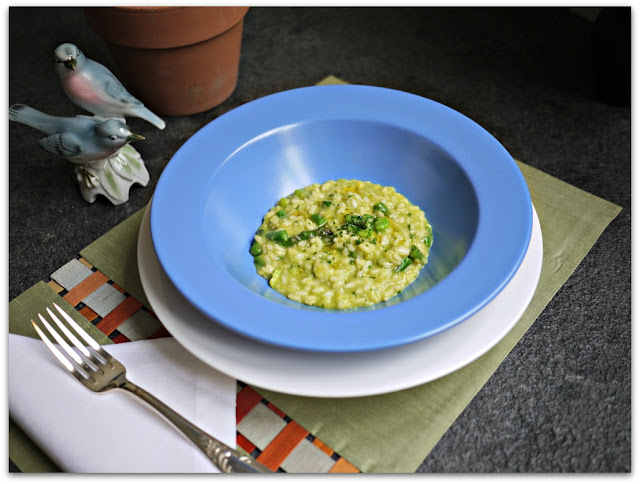 Spoon the risotto onto heated plates and garnish with the arugula, chives, and drizzle with the fruity olive oil. 1. If you'd like your risotto to be really creamy, add 1/4 cup of Basmati , Arborio or Carnaroli rice to your stock and simmer for 20 minutes before you strain it. If you're using vegetable broth cubes to make a stock, add some chopped carrots, celery, onion, parsley, the rice and some whole peppercorns. Simmer for 20-30 minutes and strain. This will enrich your stock and give it a fresher flavour. 1. I recommend you buy peas from Farmers' Markets where they are freshly picked. Always ask to taste them before you buy. 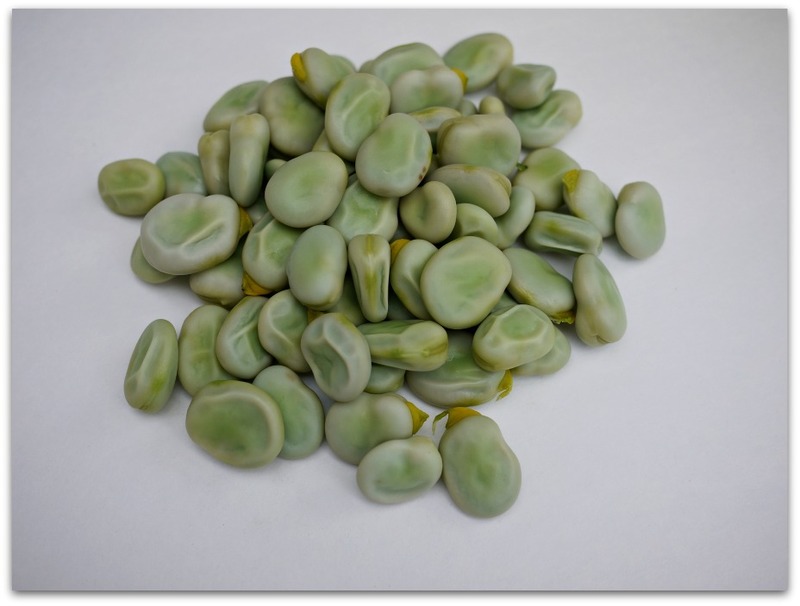 If they're fresh, the pods should squeak when you rub them together. One day after picking, they lose their subtle flavour and sweetness and the texture begins to change from tender to tough. 2. As a rough estimate, you'll need two pounds of pods to get one pound of peas. and in response to your comment, yes, isn't it windy! This is such a beautiful spring risotto. You are lucky you can find such wonderfully fresh produce nearby. Hi Sarah! It's ironic that you say that because when I read your posts I think, about what beautiful, mesmerizing adventures you have with such exotic things to cook with!